Other embellishments for a passage or commentary form outlined designs in ink with a scallop, a hand holding a club, a hooded human head facing left in profile. 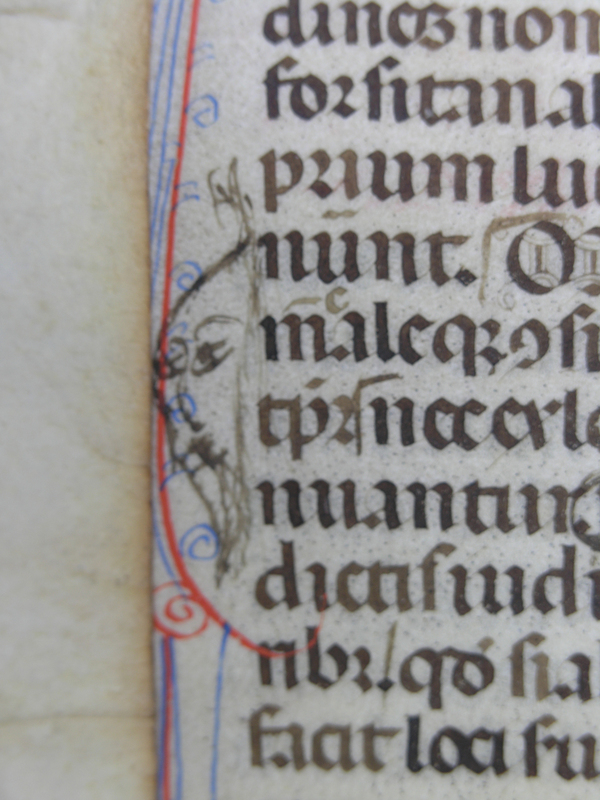 and a bearded head glumly staring away from the text. The ensemble offers a complex layering, archaeological in nature. Not to mention the composition and transmission of the texts themselves, as well as the training of the scribes and artists in question, the layers of this artefact progress from the growth and production of the animal skin itself, as well as the procurement and production of the inks, pigments, and writing or painting implements, through the preparation of the manuscript with both text and image (polychrome penwork and painted, decorated, initial included), then through the acquisition of added notation and sketches pertinent in various ways to the main text, unto the severance package which removed the leaf from its original manuscript and re-purposed it on its own for wrapping some other material (new folds, ties, and title included). The removal of that other material, of whatever kind, and the sale of the wrapper alone, without documentation of its provenance, apart from apparent Italian sources at several points in its history, form a further dislocation which obstructs a better reconstruction of the origins and travels of the leaf. The wrapper was acquired by purchase from the Libreria Leo S. Olschki in Florence, Italy, for US $10 on 20 June 1972, along with 4 other items at other prices (including Handlist Numbers 2, 18, and 20; the last item is not yet identified). Let’s see the outside and inside of the wrapper as such. Exterior, then interior, opened out. As it happens, and as the sequence of text establishes, the exterior is the original recto of the leaf. 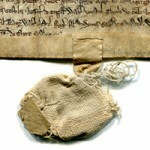 To produce the wrapper, the leaf had to be removed from its original manuscript. The relatively straight edges at both sides of the leaf, with a few nicks along the edge now folded towards the back or interior of the wrapper, indicate that the leaf was sliced along the original fold line, or gutter, of a bifolium (a single sheet folded into a pair of conjoint leaves) sewn into the former manuscript. 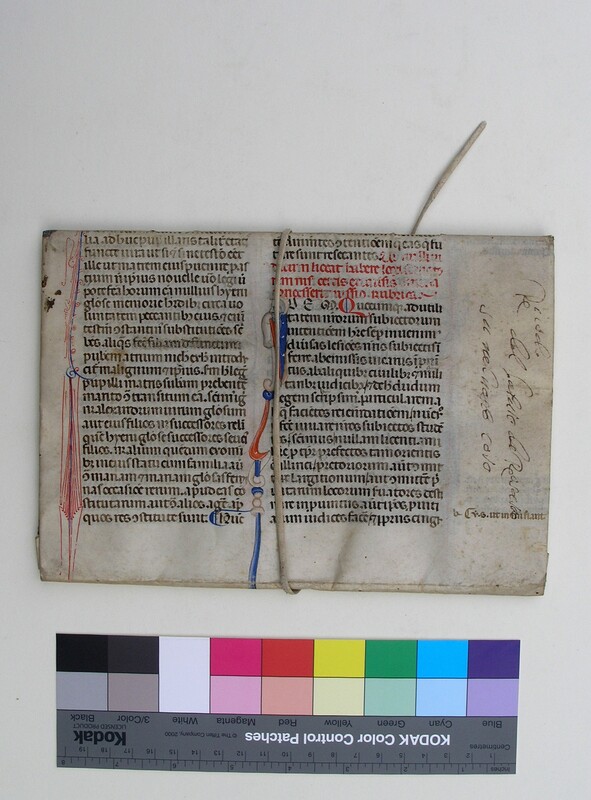 The opposite edge is somewhat darkened, with deposits of dirt or dust acquired over time during its former existence as part of an outer edge of the manuscript in its bound state. The upper edge of the leaf — or, rather, its remainder apart from the mitering reductions — is similarly darkened, from the same cause. As reshaped for the wrapper, the original margins at both sides of the leaf were turned toward the back so as to narrow its width. 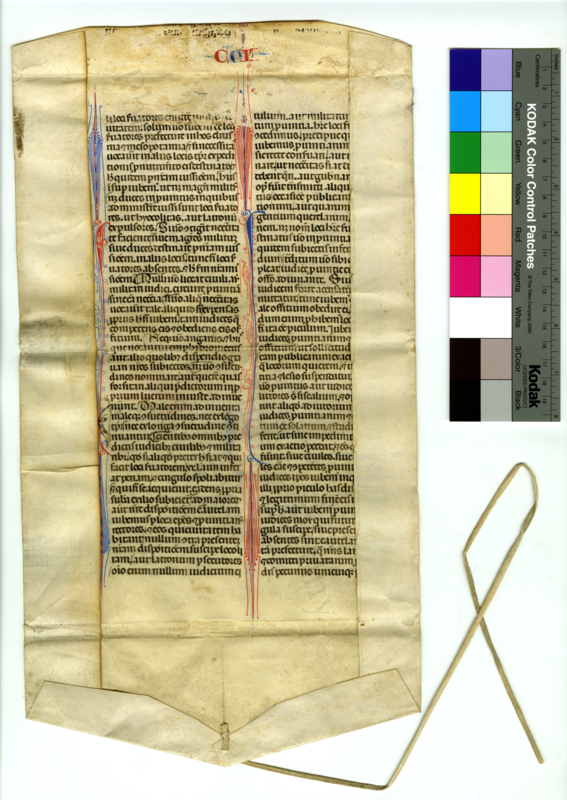 Then the top and bottom margins were folded inwards, with tapered or mitered corners which trimmed away parts of the original leaf. 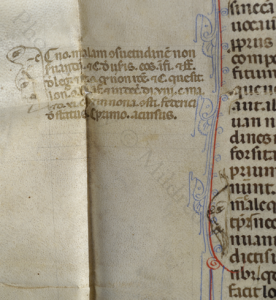 The upper margin was folded down more-or-less horizontally. 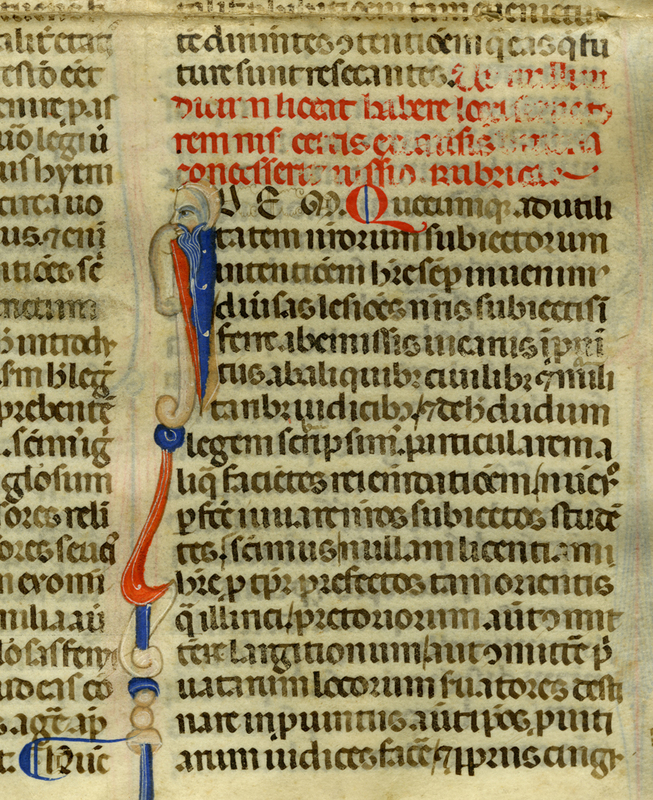 Given a short vertical slit about halfway across its lower edge, the lower margin was folded and pasted into a V-shaped flap, overlapping the right half over left at the center bottom. A further pair of slits above and below the overlap gave access for threading the added vellum tie to secure the folder with its added contents. The extent of the extant margins — mitering aside — implies that the leaf retains most, if not all, of its original extent, including the span of its former margins. Insofar as the former gutter retains some faint, but recognizable, traces of the stitching of the volume, it seems that the volume had only one phase of stitching, and therefore one binding, in its history as a whole book. On the whole, an impressive and expansive leaf. If the rest of the volume maintained (or exceeded) this demonstrated calibre of design and execution, it would have been a fine book. Shame about the dismemberment. 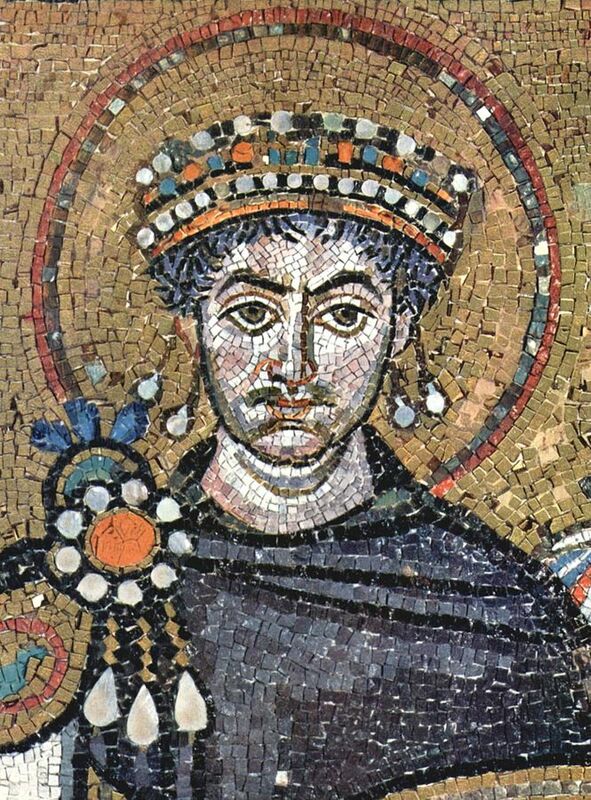 Justinian I in mosaic form at San Vitale in Ravenna (constructed 526-547 CE). Via Wikipedia Commons. 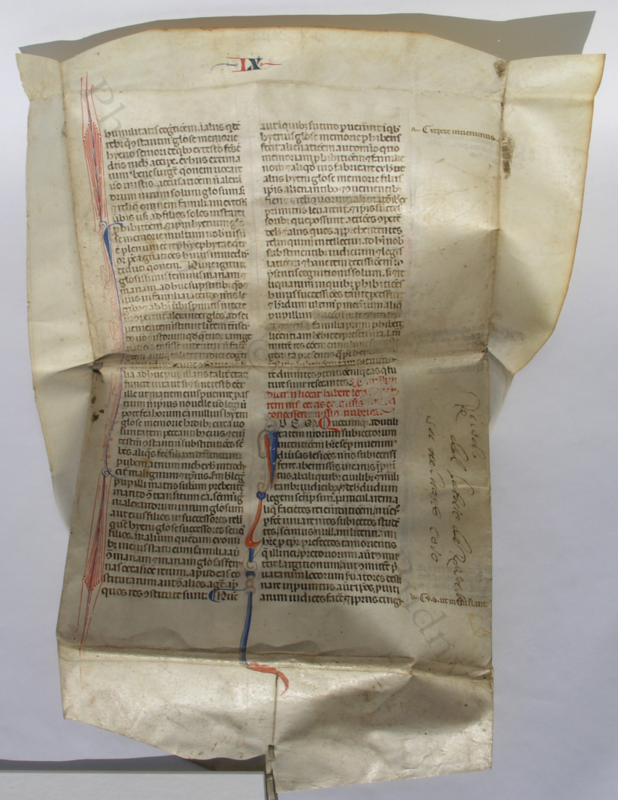 The original leaf contains part of the Emperor Justinian’s Novellae Constitutiones, of the Corpus Iuris Civilis, with some brief sections of Commentary added in the margins of the inside of the wrapper. 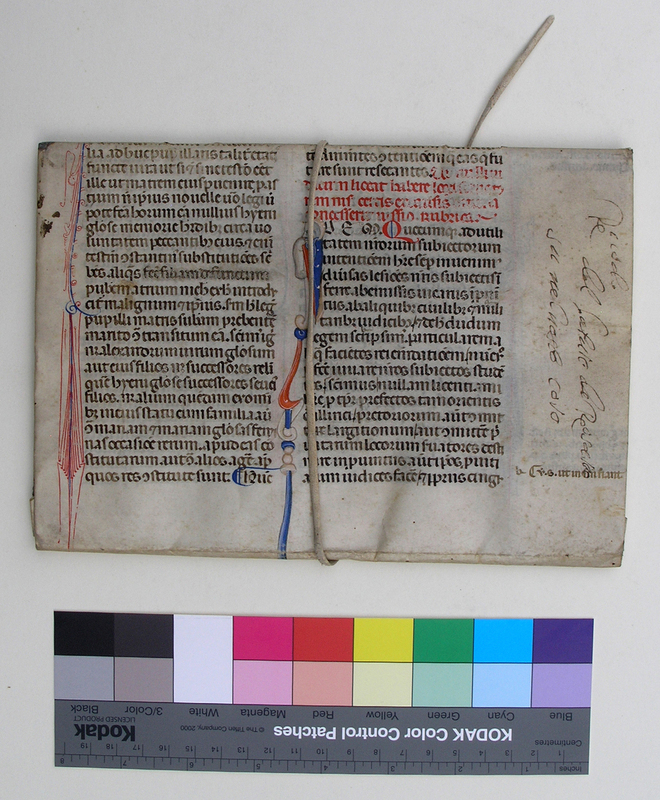 The wrapper partly hides the end of the text, which can readily be seen with gentle lifting of its turn-in. Photo below. These Novels were the fourth, last, part of the collection of civil laws assembled in the sixth century CE under the Emperor Justinian I (East Roman Emperor from 527–565 CE). 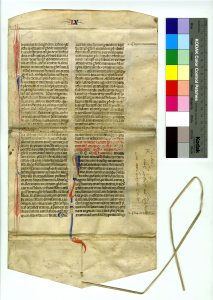 That part of the Corpus circulated in a version known as the Authenticum, often accompanied by the group of extensive commentaries — resembling the massive Glossa Ordinaria (produced for the Bible, likewise a complex layered text) — by the jurist Accursius or Accorsio di Bagnolio (circa 1182 – 1263). The sequence of the text on the leaf demonstrates that the original recto, the whitish flesh side of the animal skin, is turned toward the outside of the wrapper. The hair side, with some peppered surfaces retaining the dark hair follicles of the skin, is turned toward the verso, or interior. As wrapped, the folder presents a slim packet, with a tapered flap to fold across the front and back panels and an attached vellum ‘tail’ to extend beyond the flap, continue the wrapping, and secure the enclosure in the form of a tie of some sort or other, variably. The resulting shape resembles an open-sided envelope. Viewed as such, the original text on the leaf stands upright. 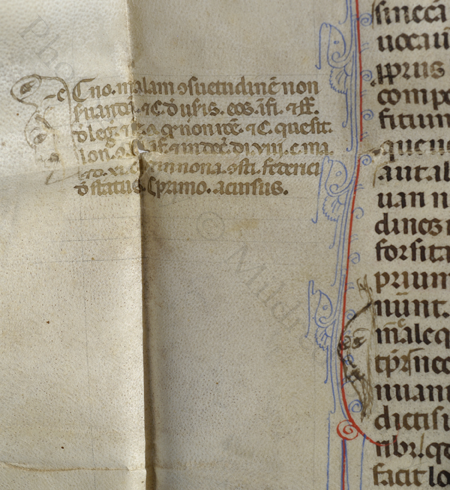 The extent of the margins (mitering aside) implies that the leaf retains almost all of its original span. Insofar as the former gutter retains some faint, but recognizable, traces of the stitching of the volume, it seems that the volume had only one phase of stitching, and therefore one binding, in its history as a whole book. When the time came to remove the leaf, it could turn to new use as a cover on its own. An eye for a decorative front guided the choice to put its best face forward, with the beautifully painted initial for Novel 134 onto the ‘front cover’ of the wrapper. 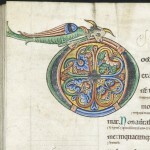 However, in that orientation, the original text was upended, with the tops of its lines toward the left, and the bearded human head of the initial was forced to look downward, with its rounded cap toward the left. A 3-line title or inscription written in a rapid cursive script in brown ink in Italian presumably identifies the former contents enclosed by the folder. This modern inscription stands perpendicular to the original text, in the lower right-hand margin of the recto, that is, on the back of the folder. With the closed folder turned on its side and its back toward the front, the title stands upright at the top of the unit. Perhaps it reads: Reco[r]do / del batutte de Rosasao / su nel nost[r]o Covo (“Document [or Dosier] of the Batute of Rosa Sao in our Covo“, maybe meaning Covo in Lombardy, if not some “den”, “hideout”, or “lair”). The provenance of the Wrapper, acquired in Florence without a record of its travels, may help to focus the interpretation. The answer might be obvious, but not yet to me. Help Wanted. Continuing to peel back the layers of accretion, we turn to the original manuscript leaf and consider its components in sections or stages. 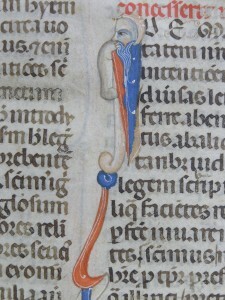 First the nature of its Condition, next the sets of glosses as Commentary, with their links to the text and their forms of embellishment, then the decorated, figural Initial. A follow-up Post will attend to other features. Some of the first 2 lines of text on the interior has offset onto the upper margin. Stains and wear have affected various parts of the leaf. 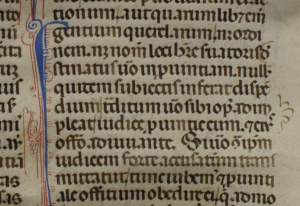 Entered in the outer or inner margins beside the columns of text, upon lines ruled to carry and orientate them in seemly regularity, there stand several marginal glosses or commentaries upon specific passages of Justinian’s text. 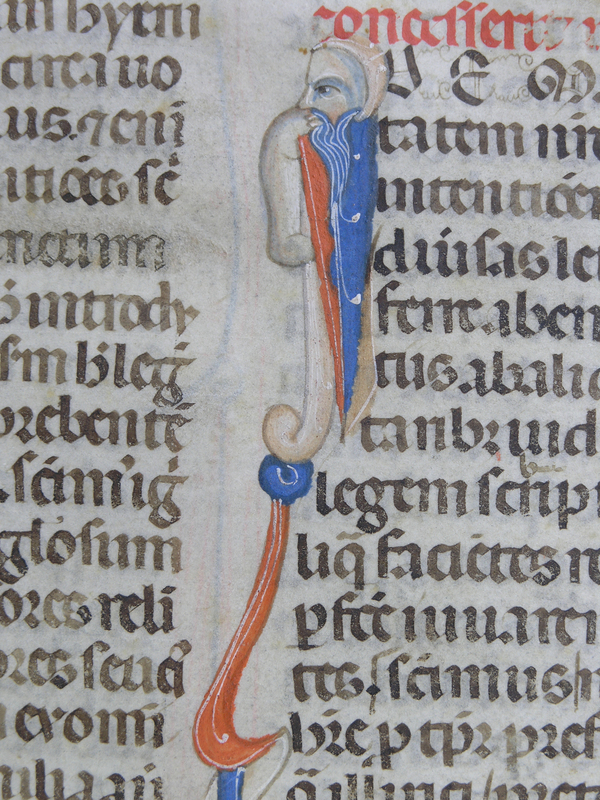 Not all the margins contain glosses. 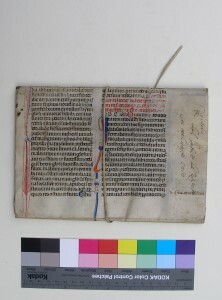 The margins at the left on the recto and the right on the verso have none, as revealed by viewing both sides of the folder and gently lifting the folded, but unpasted, sides of the interior — that is, the long portion of the margin above the pasted portion of its lower flap with mitered corner. Commencing with a C-shaped paraph-sign in the same brown ink, the glosses are linked to their corresponding passages by alphabetic signs comprising single letters in a sequence beginning with a in each margin, moving on to b, c, and d down the page, and, ideally, linking with the same letter in the adjacent column. Such a pairing allows for matching the gloss with the specific location in the text where its comment should be considered. In a perfect world, that is. However, on this leaf, the system is not fully consistent in its application. But it still works. Especially when you understand the system and know what to look for. The forms here involve mirrored or identical pairs which combine a single letter with a single stroke, more-or-less horizontal, to one or other side of the letter. ‘To the Left, To the Left’, for the left-hand column and its margin, but the opposite for the right-hand column and its margin. Sometimes the glosses and their cues stand relatively close to each other, sometimes not, and sometimes the matches are not made manifest, as a cue letter is left unanswered in the margin, or a gloss-sign has no matching cue letter. On the recto, to the right of column b, 2 glosses of 1 line apiece appear respectively opposite the first line and the interline between the last 2 lines of text (lines 1 and 45–46). Each gloss is preceded by its letter-sign (a– and b–). One might think that the location of the gloss could suffice as an indicator of the relevant passage, as these marks have no matching sign within the column. The matching sign b– occurs subtly in the interline above scripsimus in line rb37 within the Preface, fully 10 lines above the gloss. It takes some hunting to fetch. Lines va1–3 with 3 lines of glosses (‘gloss lines’ 1–3), with each gloss comprising 1 line. They form glosses –a, –b, and an unanswered [–c], with the top lines partly offset onto the upper margin in its folded edgeThat is, lines 1 and 2 of the glosses are preceded with the letters a and b; their line 3 has no mark, as if it follows within the b-gloss, but with its own paraph-mark. 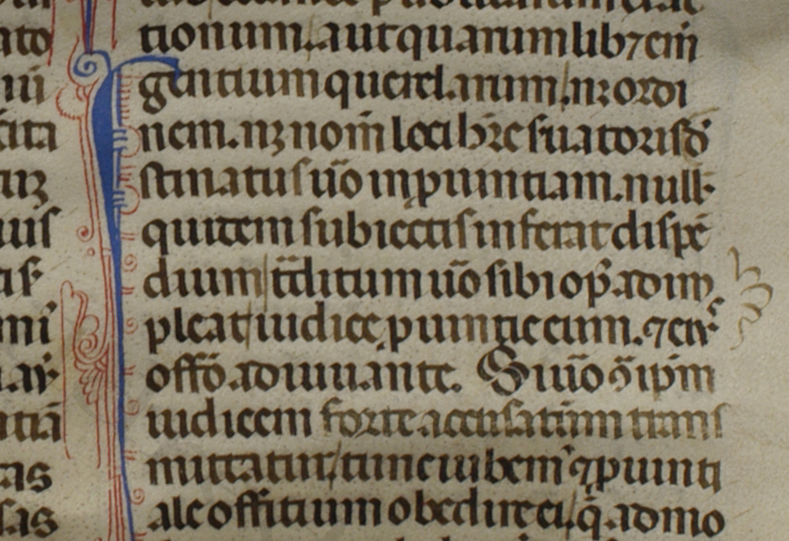 Meanwhile, within the text, the answered-or-answering marks a, b, and unrequited c, appear superscript above the end of line 1 (ci-/vitatem), near the end of line 2 (above esse), and suspended in the interline at the end of lines 3–4 (directly overlying the sheaf-like cluster of border ornament in the intercolumn). So, here we go. 1, 2, 3, etc. Pictures first, explanations next. A scalloped outline with 3 lobes and curved tips forms a fancy edging for the outer edge of lines vb14–16. A clasped fist, thumb-side up, holding a more-or-less vertical club or staff reaches outward from the decorative border at the left-hand-side of column va, opposite lines va5–8. It appears to emulate the clasped hand, drawn in red, thumb-side down, which, alongside lines 13–14, grasps onto the inner outline of the tapered I-shaped stem rendered in red pigment among the segments of the border itself. A somewhat roughly drawn wide-eyed and downcast human head with a large hood faces right in profile beside lines 1–5 of the 6-line Gloss c opposite va22–27. 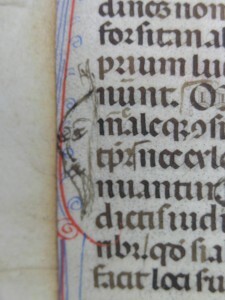 Rendered in the same light-brown ink as the gloss, this partial creature’s closed contour includes the –c sign for the gloss. An elongated and seemingly sceptical bearded human head seen partly in 3/4 view squeezes into the interspace between the side of the text and the decorative border beside lines va30–35. Drawn with a somewhat scratchy pen-nib in dark brown ink, this head seems to express some reflection upon the text. Given its content, those reflections may well not be benign. Here is “BlueBeard”, seen in profile, facing right, pursing his lips, and wearing a close-fitting, crescent-shaped cap. Here we leave the leaf, with the initial suspended in the intercolumn and its bearded head gazing resolutely to the left. Further explorations of the Script (main text, running titles, rubrication, commentary), Decoration and Illustration (borders, drawings, painting, figural elements), Original Manuscript, and Context will appear in another Post. It seems useful to pause in completing the Report of this Leaf before we could return to its remaining stages, while we are working on, among other things, the reports of early Seminars and Workshops of the Research Group on Manuscript Evidence. 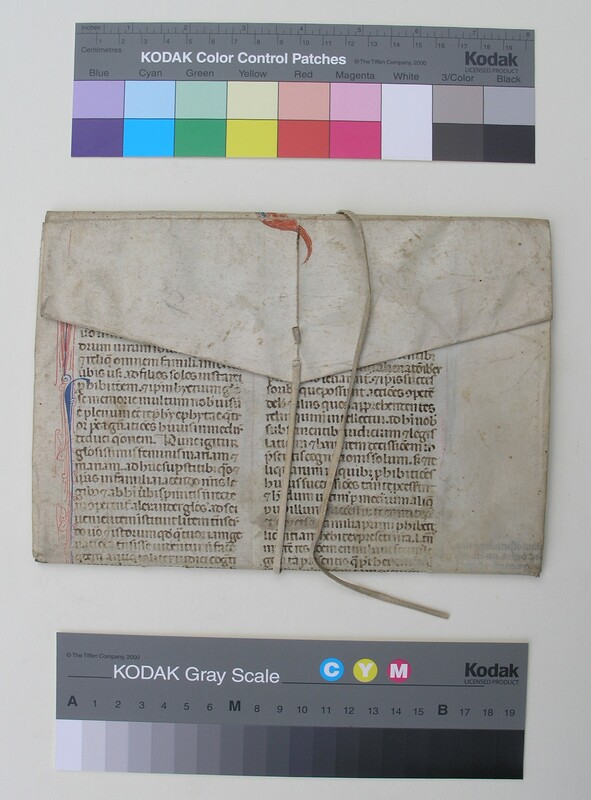 They include revisiting, and refreshing research on some other medieval manuscripts containing, or partly containing, legal texts — mostly from Northern Europe and the British Isles. 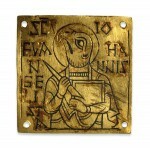 They relate to different law-makers, Anglo-Saxon kings included, to different patterns of instruction and transmission, and to worlds at some remove from the centers of production, instruction, use, and reuse of legal manuscript materials surrounding, and emanating from, Bologna in the later medieval period. I thank our Associates Valerio Cappozzo for advice about the Italian title on the wrapper, Scott Gwara for advice about the artefact, David Immerman for help with the photographic record, and the Owner of the leaf for permission to study, photograph, and publish it. 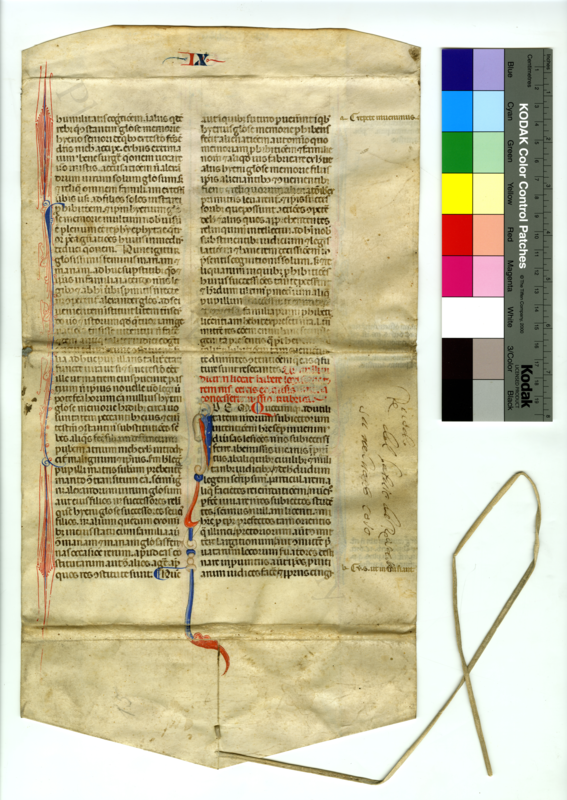 Perhaps you know of other leaves from the same manuscript, or other products of the same scribe, artist, and annotators? Please let us know! Would you like to report discoveries and research on manuscripts, documents, or other written materials (medieval and other periods welcome)? Please Contact Us! Next Stop: More Fragments, of course. 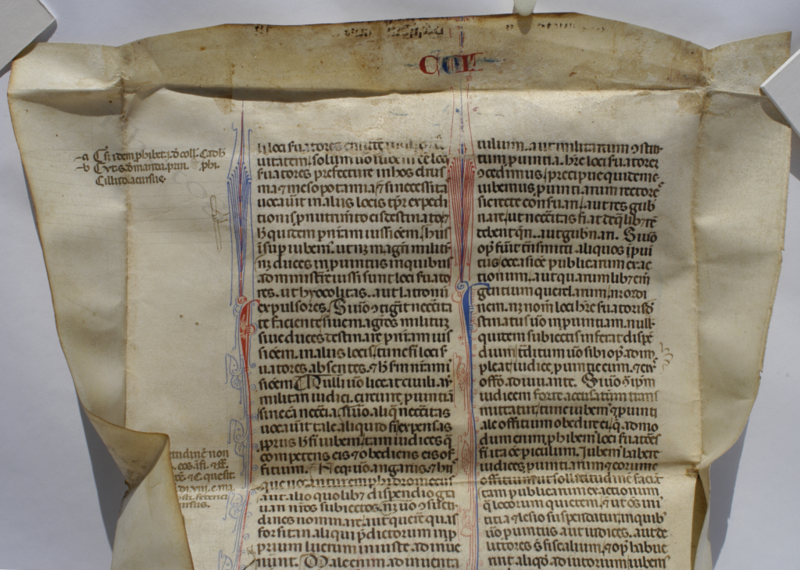 See our series of blogposts on Manuscript Studies as it unfolds, now with a Contents List.